If you've been around for a bit you may remember my dear friend Nikki and her family as many a Five Loves list they have graced. Last weekend they made the hour drive out to visit us. We enjoyed the best evening together celebrating Christmas! A collage of happiness! Here are just a few of the smile filled snapshots taken while we exchanged gifts. What a sweet Christmas celebration it truly was! Princess drew all of the artwork that our family friends are holding in the bottom photo. I loved seeing her so excited to create and give Christmas gifts to our dear friends! 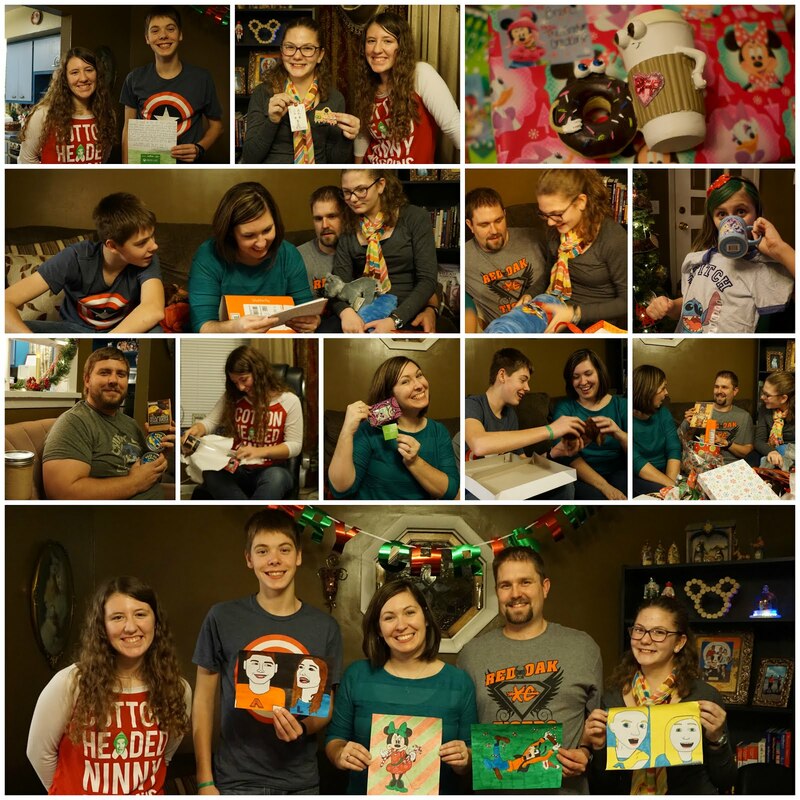 It was an unforgettable night of fun, laughter, exchanging thoughtful gifts, and enjoying fantastic fellowship! Time with them always does my heart such good! When Nikki asked what they could bring I quickly offered the suggestion of dessert. (They do dessert well!) Her hubby, an excellent baker, blessed us with a super scrumptious chocolate frosted chocolate cake topped with Mickey shaped sweetness! MmmMmmMmm! There is something so incredibly special about loved ones who know you so well that they choose the perfect gifts! This Christmas party reflected just how well we all know each other, which in itself was the greatest gift! Little One attended a painting class with a group from our church and created such cuteness! 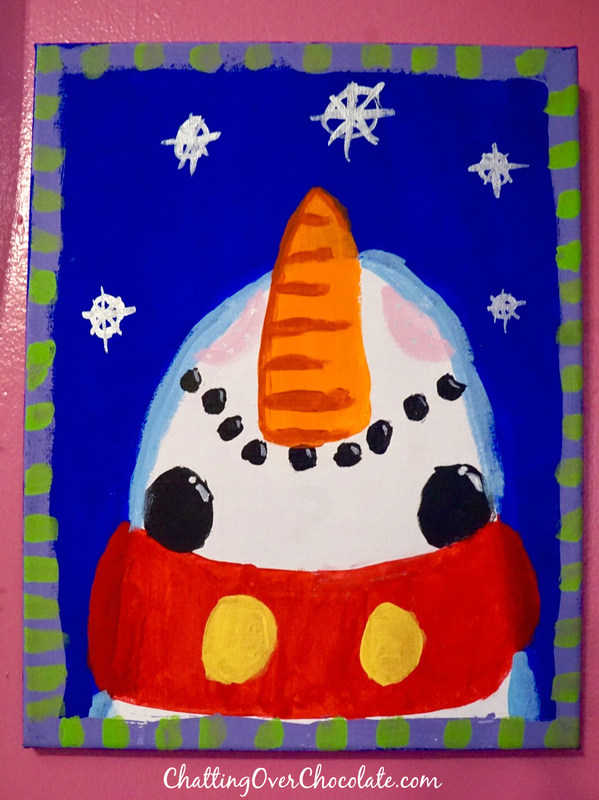 Everyone was taught how to paint this adorable snowman looking skyward surrounded by snowflakes. They were told they could customize this frosty guy's scarf any way they'd like. She decided to go with a Disney theme (that's my girl! ), giving the scarf Mickey ears and Mickey Mouse buttons! I think he may just be the most magical snowman who ever charmed a canvas! 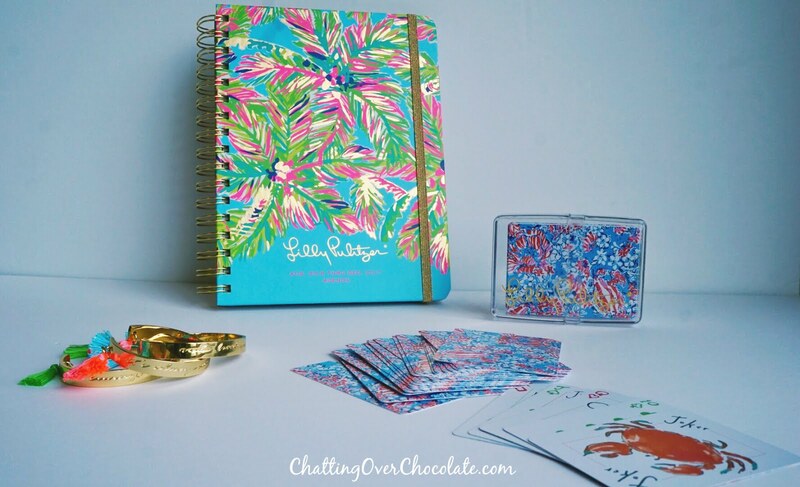 So, I already got a polka dotted Kate Spade 2017 planner for my everyday plans (which I also scored on sale plus an additional 30% off), but I thought it'd be really fun to have a planner specifically for blogging! This tropical beauty was clearanced out at $9, less than a third of its original price. Score! Those palm trees & golden accents make my heart skip a beat! This will certainly be a fun place to map out my upcoming Trip Report Tuesday posts! I also picked up some darling bracelets with fun sayings like "it's always summer somewhere" and "sunny state of mind", each adorned with bright, cheery tassels. Lastly, this deck of cards was too fun to pass on! I mean the queens are mermaids and the jokers are crabs! These just scream card game out on the back deck with a glass of lemonade! Can you tell I'm itching for summer sun already? Meanwhile, these make my heart smile! I'm being featured today on The Blended Blog! A big THANKS to Katie of The Mishaps and Mayhem of a Solitary Life for featuring me today on a lifestyle collective blog she contributes to, The Blended Blog! 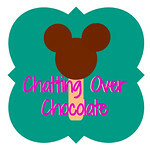 I'd be tickled pink if you'd pop over there today and check out my Q&A! But first, I'd love it if you'd leave me some comment goodness below. Hearing from you makes my day, friends! Those letter boards are too cute!! Congrats on the feature! And I am loving that Planner - it's a beauty!! So glad you had such an awesome week. Hope your weekend is just as great! Happy Friday! I love those letter boards - I need one! And that donut mug is amazing! The snowman canvas your daughter made is so adorable! Have a wonderful weekend! I was so happy you're being featured on our Blended Blog today! Such a fun Q&A because you are such a fun sweet and beautiful inside and out lady! Ahh wonderful nights of laughter with family & friends is what it's all about! I do hope you have a cozied up weekend gorgeous lady! Oh, Bren! I could not be more excited about your love for your gift! Perfect for a "wordy" girl like you! We had so much fun celebrating with you all! What a gift your family is to mine! Happy Friday!!!! Congrats on being featured! I just adore that coffee and a donut ornament! I want one for myself! And great job on the Lilly scores! Have a great weekend! That coffee and donut is so cute! I also love that board from the letter folk co. I've had my eye on them for awhile! What a fun Christmas celebration you had! And I love your gifts! 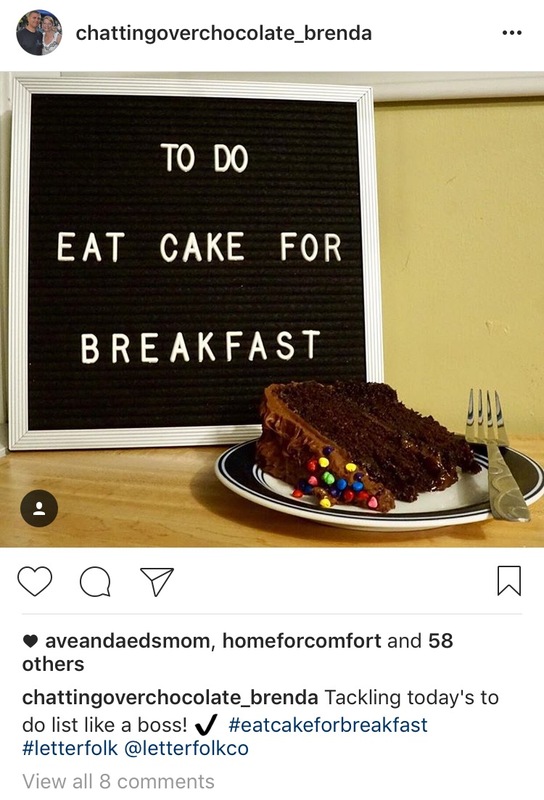 Especially that letter board!! What a great deal on that Lily planner. And it's so pretty! Have a great weekend! Great stuff!! 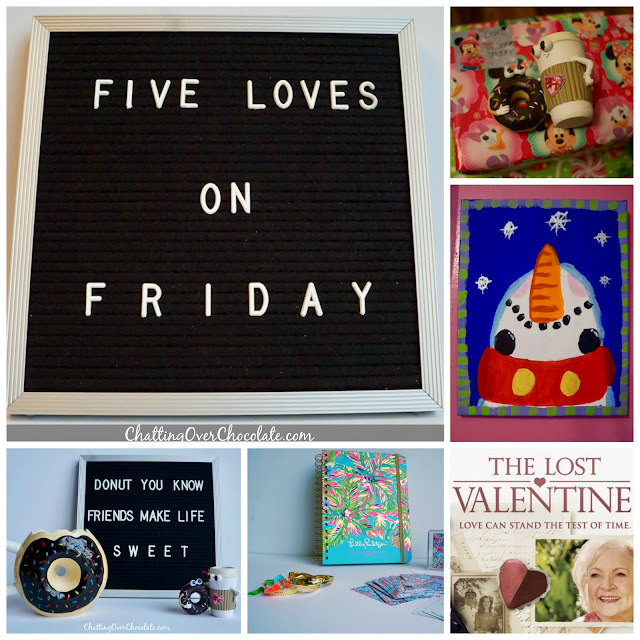 Those letter boards are so much fun, I love that you have one! Hope everyone is feeling much better this weekend! 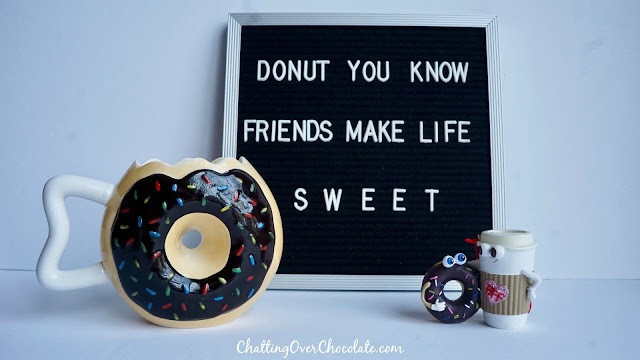 I love that Letterboard...such a great gift that you will use many times throughout the year. What a lovely blog you have! I'm so happy to come over and read a little. Hope you had a great weekend! I love the letter board, what a great gift! And that chocolate cake looks delicious! Awww, looks like an awesome time was had with Nikki & family!!! And I was wondering if you'd gotten that letter board recently - so cool! I've been wanting the other version, I think it's called the Lightbox, but this one is really neat too! Love this!! 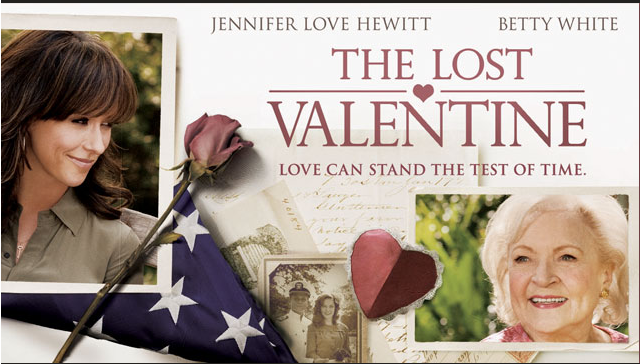 I do have to say that The Lost Valentine is one of my absolute favorites, I've seen it a dozen times!!!! And YAY for being featured on TBB!! Thanks for contributing!